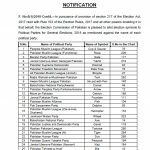 The Election Commission of Pakistan has announced General Election 2018 bon 25th July 2018. 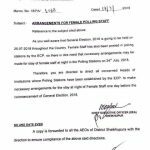 In this regard, preparations for election is in progress. 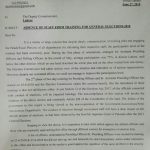 All the Principals working under administrative of this Department are hereby directed to comply with the following fail. 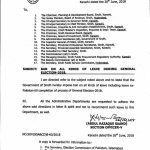 Moreover the names of the employees of collage have been sent to the District Election commission (All) Karachi Division.
. All the teaching &non-teaching staff (from grade/BS-05 & above) is strictly directed not to leave headquarter during summer vacation.
. 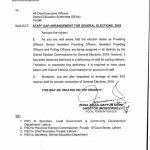 The staff engaged by the Election Commission must remain in contract with the Principal concerned and communication means to remain active twenty four hours.
. To avoid any show cause notice and legal action by judiciary, all staff members are directed to attend schedule without fail.
. Those staff members, who failed to attend training session are directed to appear in leftover sessions shortly from 4th June, 2018 in the concurred district. 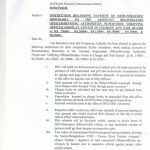 This should be got noted by the entire staff and an acknowledge receipt of the same may be sent to this Directorate for record. 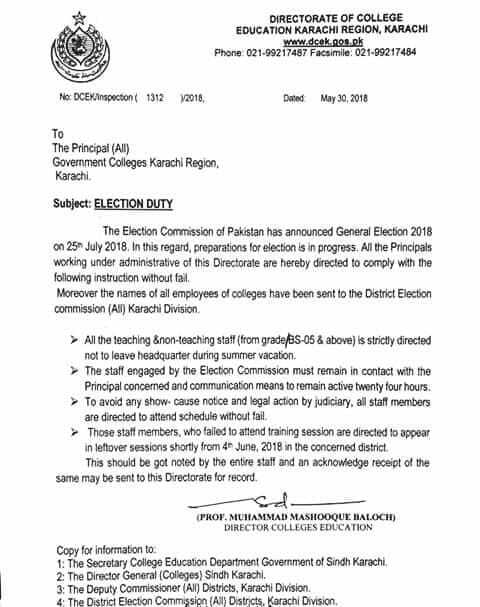 Special thanks to Mr. Zahid Khan for sending the copy of the Notification of Election Duty 2018-Directorate of College, Education Karachi Region.